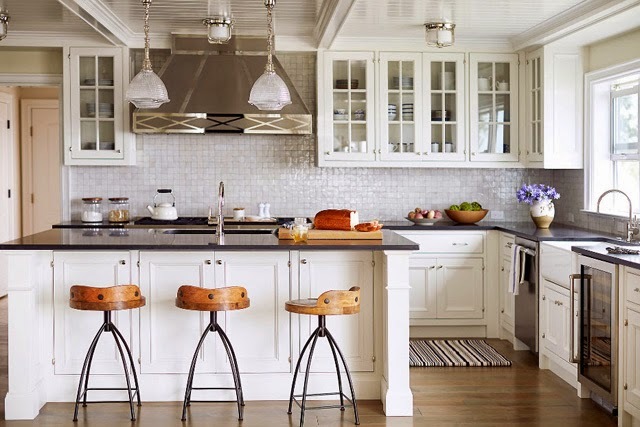 While I am not overly inclined towards two tone kitchens, I really don't mind the above combination perhaps as backsplash is carried through and seems to be an extension of upper cabinetry. It allows for lower, darker cabinets not to overwhelm the space, but just ground it and allow it not to be just another white kitchen. This is what happens when you have too much time to plan something - you get to second guess everything and your tastes change depending on what you see. I also like how cabinetry is broken up by shelves. The above kitchen is too rustic for what I am going for in our house but I just love how this farm table is used as an island or working bench really. I've been thinking of incorporating our long walnut table from the basement into the kitchen area and seeing the combinations of this in inspiration photos reinforces it for me. I would, however, go for more of a juxtaposition of sleek and rustic than all rustic. This french bistro style works for me and I love this table again. I also like that hood is a statement but a main focal point of this space. 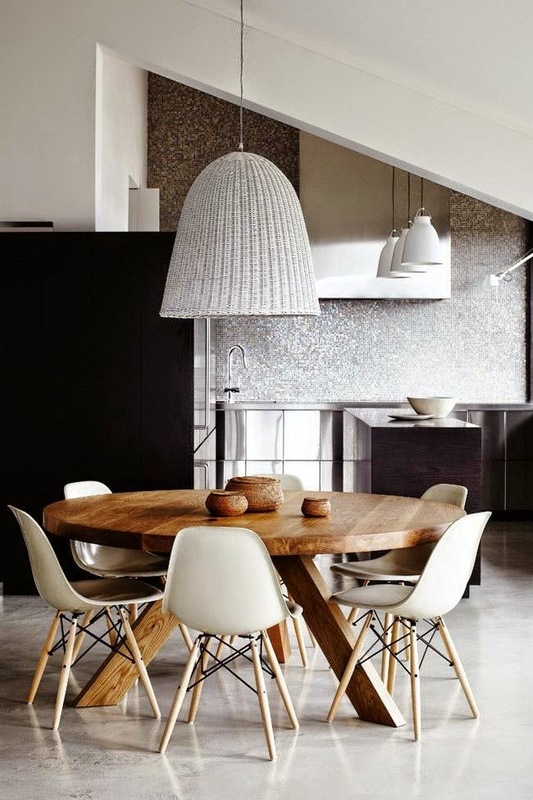 Really like the pairing of sleek modern dark mat cabinetry with shiny backsplash and warming it all up with this great dining room table. Layout-wise this is pretty much how my kitchen is currently set-up. I've been contemplating all glass uppers just to make it appear very open and airy without the use of shelves even if it means keeping it all nice and tidy. 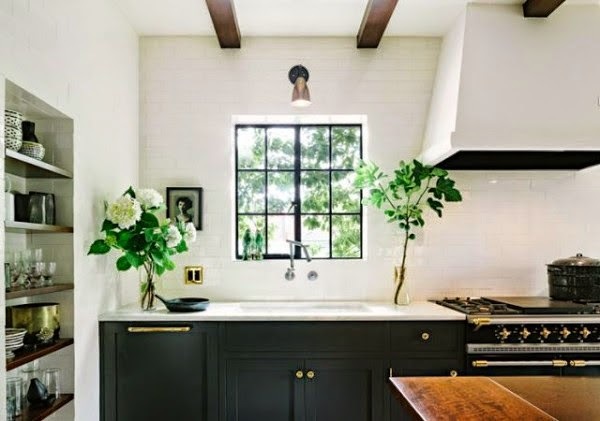 Looking at this space - while I love it - I am also realizing that I am getting tired of white (light) cabinetry with black countertop which is basically what I have right now. I've included the above image primarily because I like how the hood has been incorporated with cabinetry. All white cabinetry? Check. Glass uppers flanking the window? Check. Marble (or marble look-a-like) countertop? Check. That je ne sais quoi? Iron and steel frame window. 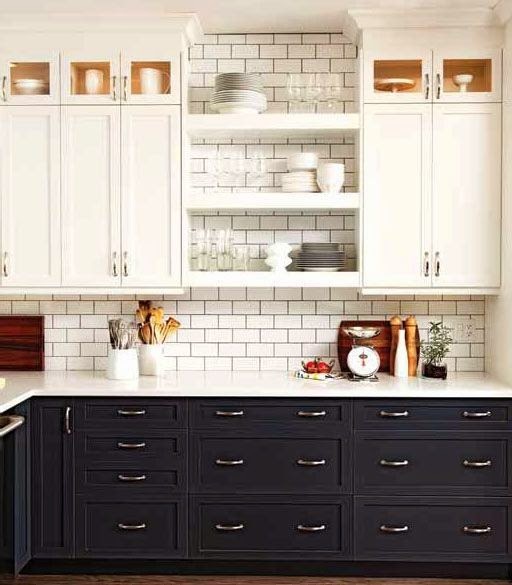 Looking at the above photo I realized that I can achieve the same effect of adding some punch to lower cabinetry by just flaking it with dark posts without going full black - it also looks much more unique than most two tone kitchens you find. I can just see myself in this space - love that black inside of the hood and I will so try to do it. Love the table which looks like mine. While I will not have beams, iron frame windows, fancy stoves, will need upper cabinetry, I welcome the challenge to create a space that gives you the similar feeling on a strict budget! Now that I've went through a number of inspirations - it is time to collect the thoughts and put it all together in some preliminary designs or at least concise list of achievable wishes. We definitely need a good level of inspiration for our kitchens and therefore, we need to follow different ingredients and instructions to decor and design our kitchen. Kitchen and bathrooms are the best part of every home, therefore, it requires special attention and cares with the right design. 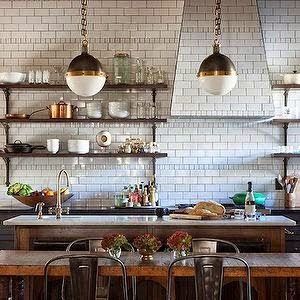 As a homeowner, I would like to follow some beneficial instructions from here this article about how to decor our kitchen interior.